I would imagine the ordinations of clergy will occur primarily in their local Catholic diocese by the local Catholic bishop. Certainly that is the case with Edwin Barnes. I don't see why prospective ordinands could not request ordination according to the Old Rite. I would suggest that 50-60 was a highly optimistic number and would be very pleasantly surprised if the first wave saw even 15-20. Just curious, will 'Liturgical Note's' and company be crossing over the bridge or waiting for 'retirement'? 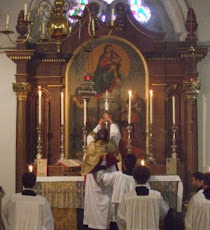 Ordination to the Priesthood: February 18, 2011, Buckfast Abbey at 11am. Already David and Joyce Silk have been received into the Catholic Church. He is to be made Deacon by the Bishop of Plymouth at a private ceremony in Buckfast Abbey on February 15th, and three days later will be ordained priest. Anyone able to get to Buckfast for 11am on Friday February 18th will be very welcome; but please let David know in advance so that he can tell the Abbot how many visitors to expect. Fr be as tendentious as you wish as long as you are lying down with the dog in the manger.